Craft Buff: Welcome to the World, Peter Kenneth! My cousin-in-law and fellow Rachel (yes, that's Rachel with an "el," not "ael;" you might not believe how much it matters unless your name is Lara and you're constantly called Laura) recently had a little baby boy. Prior to his arrival, I sent a polar fleece blanket to welcome him. 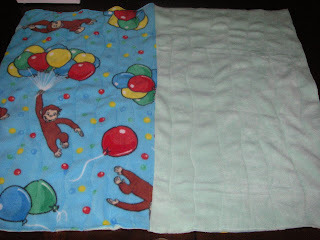 I understand that his big brother Nate promptly fell in love with it, however, so I believe there will be two more polar fleece blankets (for Nate and his sister Eliza) on my crafting to-do list this summer. I like working with polar fleece because it's made from recycled plastics and the softness and bright colors are, as Nate's response indicates, fun for kids. I'd be interested to know if anyone's heard anything negative about it, such as adverse impacts of production. If not, a tip for those interested in making baby blankets like these: If you check the discount bins for fleece remnants at your fabric store and find two complementary pieces of 1/2 yard each (or so), you can cut each of the 1/2 yard pieces into two, and then sew one of each piece together (as above with Curious George and green), do the same thing with the other two pieces, and then sew those back-to-back so you've got a double-thickness fleece blanket, perfect for a little one. Because of a special remnant sale, I spent only $3 on the supplies for this. Crafty, cozy, and cheap!